When you stay at Résidence Pierre & Vacances Premium Les Fermes de Méribel in Les Allues, you'll be near ski lifts, a 4-minute drive from Meribel Ski Resort and 9 minutes from Courchevel 1300. This 4-star residence is 6 mi (9.7 km) from Courchevel 1650 and 9.8 mi (15.8 km) from Courchevel 1850. 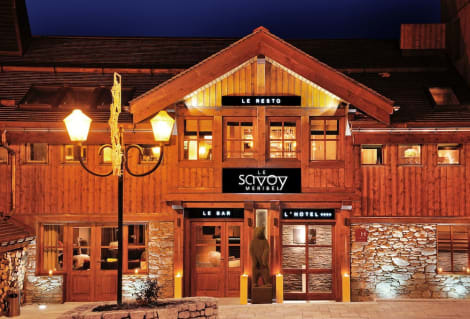 Grab a bite to eat at La Table du Mottaret, a restaurant which features a bar, or stay in and take advantage of the 24-hour room service. A complimentary buffet breakfast is served daily from 7:30 AM to 11 AM. Make yourself at home in one of the 74 guestrooms, featuring kitchenettes with refrigerators and stovetops. Rooms have private balconies or patios. Complimentary wireless Internet access keeps you connected, and satellite programming is available for your entertainment. Conveniences include microwaves and coffee/tea makers, and housekeeping is provided once per stay. Spend the day on the slopes, or enjoy other recreational amenities, which include ski-in/ski-out access. This residence also features complimentary wireless Internet access and ski storage. The ski resort of Méribel, in the French Alps, part of Vanoise National Park, is at the very centre of the world's largest ski area. The biggest resort in the area, Méribel, has access to more than 370 miles of piste and off-piste skiing. Book a Méribel hotel with us and discover a snowy retreat brimming with charming Alpine architecture. Founded by a Scot, Colonel Peter Lindsay, in 1938, Méribel is one two main resorts in this region, the other being Méribel-Mottaret. There are also a handful of traditional villages nearby. Méribel has the Olympic Centre which opens daily. Here you'll have access to a 25m swimming pool and children's pool, and waterslide. There's also an ice rink, spa, climbing wall and gym. The resort has 46 ski lifts which give you excellent access to the slopes. Updates and improvements are made every year in order to boost efficiency and speed. As well as skiing, there are opportunities for walks, snow-shoeing and snowmobiling. You can even take a ride on a horse-driven sleigh. Of course, it doesn't snow all year round but the resort remains open in July and August when it becomes ideal for mountain biking, walking and golf as well as a host of children's activities. Most of the villages close to Méribel are accessible by walking, and some by skiing. There is also a good bus service. The villages around Méribel range in height from 1600m to 1700m. Altiport, located in a tranquil wooded area, is the highest at 1700m, and is less than four and a half miles from Méribel. Les Allues, at an altitude of 1200m and just less than four miles from Méribel, is a charming, unspoilt and relaxed village. At a height of 1750m, and about two and a half miles away, Méribel-Mottaret, developed in the 1970s, has a much more modern look and feel. A good place to explore all three valleys, you can ski to Méribel from here quite easily. The resort has a lively town centre with a range of restaurants and cafés. The food is predominately French but you'll find British and Italian eateries too. If you just fancy a quick espresso, a cup of tea and a cake, there are tearooms and cafés that provide around the resort. The main shopping area is in Méribel itself and you'll find several retailers specialising in ski wear and skiing and snowboarding equipment. Fashionistas will be pleased to know that there are many boutiques selling designer brands. Children are catered for too and won't miss out on fashionable French clothing and skiing gear. The resort has supermarkets and standalone stores selling English-language newspapers, groceries and gifts. And there are photography outlets, charcuteries, patisseries and more. The town centre also hosts a street market that opens twice a week.